Thanks to the success of a simple idea called the One Tomato Project, people across Sarnia-Lambton are enjoying hundreds of pounds of fresh vegetables this summer. Some are helping themselves to communal gardens on their way home from work. Others are out of work and happy to have free access to corn, beans, tomatoes, peppers and more from those same gardens. Circumstances don’t matter, says One Tomato co-founder Megan O’Neil-Renaud. When One Tomato started six years ago, she and Darren Hakker, another socially-minded Sarnian, were inspired by Second World War Victory Gardens grown by the community to ensure no one went hungry. On Earth Day 2009, the Project began humbly with the planting of one potato in a downtown planter on Front Street. “We had to plant a potato because it was freezing cold and a tomato wouldn’t survive,” O’Neil-Renaud laughed. The community was encouraged to plant a garden, even as small as one tomato in a container, then plant a little extra for others. Organizers suggested donating any surplus produce to the Inn of the Good Shepherd food bank. The following year, O’Neil-Renaud and Hakker planted Sarnia’s first communal garden near the library and handed out 500 tomato plants during Artwalk downtown. Their message was that Sarnians needed to enjoy their own homegrown produce and share what they couldn’t eat with local food banks. When volunteers wondered why there didn’t seem to be anything to pick at the library garden, it was soon discovered that the area’s homeless were relying on its food. From there, the Project took off. Land was donated for communal gardens. Local service clubs, non-profits and churches got on board with more gardens. 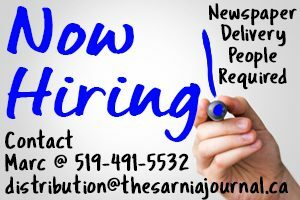 O’Neil-Renaud estimates there are at least a dozen One Tomato gardens now, comprising about 20,000 square feet of planted vegetables throughout Sarnia. 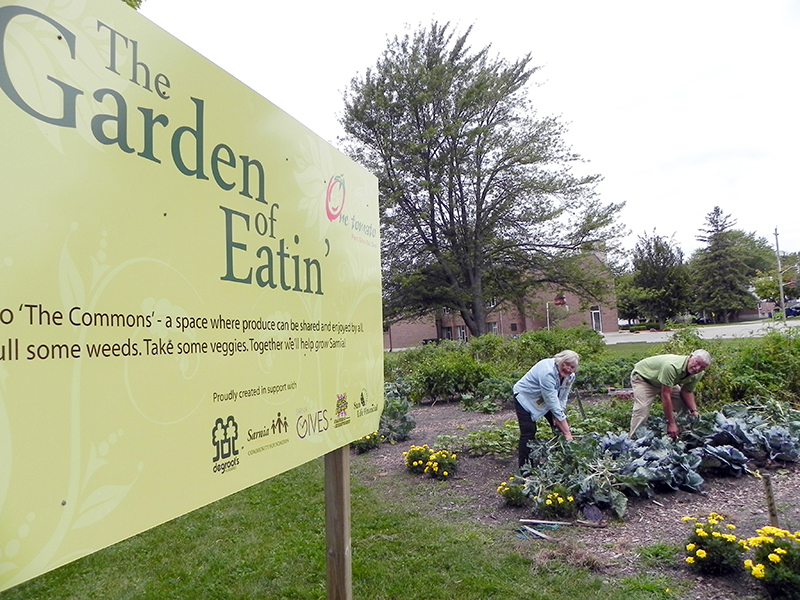 Every Tuesday and Thursday night in the growing season, volunteers from the First Christian Reformed Church are working at the Garden of Eatin at the corner of Murphy and Exmouth streets. St. Clair High School horticultural students have planted, weeded and harvested veggies from a communal garden at Murphy and Wellington this summer. “There are people here every day getting free fresh vegetables,” said Dave Watson, president of Goodwill Industries, which assists with the Wellington Street garden. “The minute a head of broccoli appears, it’s usually gone before it can even mature. “One Tomato has done amazing things in just a few short years,” he said. On Sept. 4, during First Friday festivities, One Tomato will officially kick off a new stage in development with the official opening of the One Tomato kitchen at 100 Christina St. The Ontario Trillium Foundation will be recognized for providing nearly $214,000 over three years to deliver a “Food Works” program to 1,000 students a year across Sarnia-Lambton. The money is allowing the One Tomato board to hire a Food Works co-ordinator and pay honorariums to volunteers who show kids their way around the kitchen. The idea is that if they learn to enjoy cooking and baking fresh, wholesome foods, those healthy habits will last a lifetime. WHAT: Official opening of One Tomato’s Food Works kitchen. All are welcome at the open house. WHEN: Friday, Sept. 4 starting at 6 p.m.
WHERE: 100 Christina St. in the new storefront shared by One Tomato, Return the Landscape and Lambton Wildlife. HOW CAN YOU HELP: The stove is in and paid for but the electrical box needs a $2,200 upgrade. Grant money can’t be used for it and One Tomato is looking for donations.